Make a donation to Salma's Home today. Film Independent’s Fiscal Sponsorship program opens the door to nonprofit funding for independent filmmakers and media artists. Donate today and help bring Salma’s Home to life. Three Arab women living in modern day Jordan must put their differences aside and work together in order to survive. Tangled in a family drama after Bakri dies, his two wives and his adopted daughter navigate his inheritance, finding out that the only way forward is to try and make peace with each other. SALMA (60s) is an independent woman with a serious work ethic and a cold temperament. She operates a struggling baking business from home where her daughter FARAH (20s) visits daily and is an emotional mess with marital problems. Their already difficult lives are further disrupted by bad news – Salma’s ex-husband- BAKRI (60s) has passed away. LAMIA (30s) Bakri’s new wife enters their lives desperate for money. The only inheritance Lamia received from Bakri is his share of the house where Salma lives. Lamia has no choice but to move in with Salma. Farah’s marital issues prompt her to also move back in with her mother. Lamia uses the family secret that Farah is adopted to blackmail Salma into selling the house. Finding common ground and making some life changes, all the women find a way to become a very unusual non traditional family. Make a donation to Salma’s Home. Hanadi Elyan is an award winning filmmaker whose work focuses on women and issues women face. Hanadi’s short films have competed in film festivals around the World. In 2013, After a few years of working in film in Jordan, she moved back to Dubai and established Reel Arab Productions. Based on her narrative short film work, in 2015 she moved to Los Angeles after being selected for a full ride scholarship in MFA in film directing in UCLA. 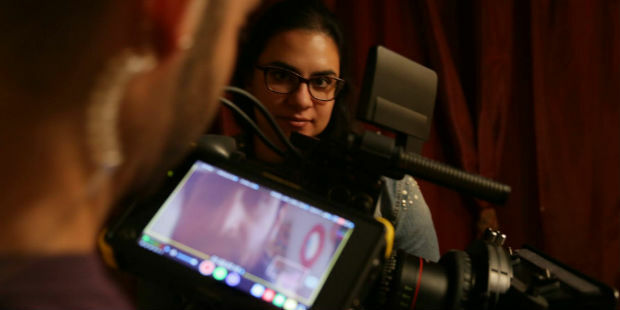 So far, Hanadi’s independent film work has focused on Arab Women, which earned her a spot in the World Economic Forum’s Global Shapers community. Awards include: Hollywood Foreign Press Association Award, Delia Salvi Memorial award, Special Jury award at Tangiers Film Festival for Mariam’s Chance and the George Burns and Gracie Allen Scholarship Fellowship in Comedy. Producer Nathan Bennett is a talented film and TV producer coming from a background of infotainment television. He started his production company Reel Arab Productions and began working on projects for the Middle East’s largest broadcaster MBC in Dubai. His company worked on over 150 TV episodes and segments for MBC and serviced international clients such as Nivea and Oracle. Nathan moved to Los Angeles and re-branded his company to Reel LA Productions and has been focusing on narrative film producing. Co-Producer Sharif Majali founded Desert Motion Pictures in 2017. He is the former Production Services Manager for The Royal Film Commission in Jordan (RFC) and has more than 12 years of experience as a Film and TV professional. During his RFC tenure, Sharif oversaw production support for countless projects. Sharif has held several key roles on various local, foreign, and major Hollywood productions. His credits include Mona Lisa Smile, The Hurt Locker and many more. Marcus Patterson is a cinematographer born and raised in Birmingham, Alabama and has been based in Los Angeles for the past five years. He has worked with some big industry hitters such as Francis Ford Coppola and James Franco. Last year, Marcus shot two feature length films — The Way You Look Tonight directed by John Cerrito and photographed 2nd Unit on the documentary Waterschool, directed by Tiffanie Hsu (now available on Netfilx). During his time at UCLA School of Theater, Film, and Television, Marcus was nominated for the 2017 ASC Andrew Lesnie Student Heritage Award for the short film Boy In The Elvis Suit. With production experience in 12 countries, he is inspired by new places and interesting characters. Marcus has extensive experience filming outside of the USA and will be an integral part of our team in Jordan.